Welcome to the New Horizons image site, where NASA and the New Horizons mission are happy to provide these JPEG images - displayed in raw form without special processing - for the public to use and enjoy. These JPEGs of images taken by the LOng Range Reconnaissance Imager (LORRI) are generally posted weekly, on Fridays, for the images received at the New Horizons Science Operations Center through the preceding Tuesday at 5 pm EDT. The date/time listed in the image caption is when the picture was taken by the spacecraft, though receipt of the data on Earth could be many days later, depending on when the image is downloaded from New Horizons. In addition, the fully validated and calibrated images will be made available at NASA's Planetary Data System within nine months to a year after receipt of all images on the ground. In all cases, the images will be available to the public, but please refer to the official New Horizons Image Use Policy for the proper use and referencing of these images. The images posted at this website were taken by the LOng Range Reconnaissance Imager (LORRI) on the New Horizons spacecraft. 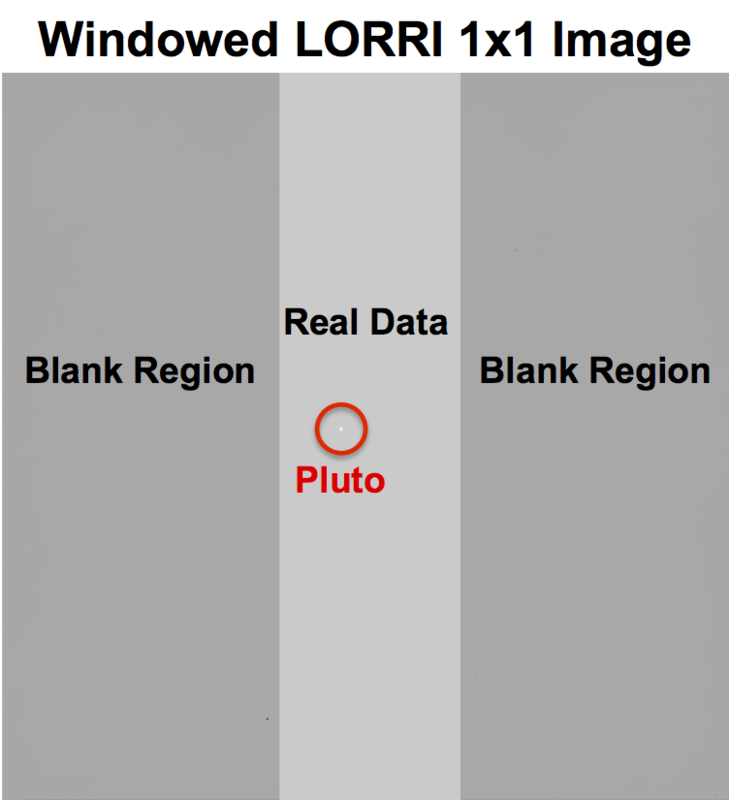 LORRI is the most sensitive and highest resolution imager aboard New Horizons. In fact, it is one of the most sensitive and highest resolution imagers ever flown on a planetary mission. LORRI is comprised of a Ritchey-Chrétien telescope and a 1024 x 1024 pixel (optically active region) CCD detector operated in frame-transfer mode. The telescope has a 20.8 cm diameter primary mirror, a focal length of 262 cm, and a three lens field-flattening assembly (see Fig. 1). The location of LORRI on the New Horizons spacecraft is showing in Figure 2. LORRI does not have any color filters; it provides panchromatic (black and white) imaging over a wide spectral region extending approximately from 350 nm to 850 nm. This was done to make LORRI as sensitive as possible for imaging objects in the Pluto system, where light levels are 1000 times lower than at Earth, and also to keep LORRI as simple as possible. LORRI has a 0.29° x 0.29° field of view, and each pixel subtends 0.00028° x 0.00028° (1.02 arcseconds x 1.02 arcseconds). LORRI can also operate in a so-called "rebin" mode (also called "4x4" mode) in which on-chip binning (co-addition of 4x4 = 16 pixels) is used to change the output format to a lower resolution (256 x 256 pixels). This mode is sometimes used when long exposure times are required (i.e., when the 1x1 mode images would be badly smeared by pointing drift), or for observations attempting to achieve high sensitivity to diffuse emission. The LORRI program is managed by the Johns Hopkins University Applied Physics Laboratory (JHU/APL) in Laurel, Maryland. The telescope was built by SSG Precision Optronics, Inc. of Wilmington, Massachusetts, and the CCD was supplied by e2v of Chelmsford, England. The LORRI Principal Investigator is Dr. Hal Weaver of JHU/APL. Fig. 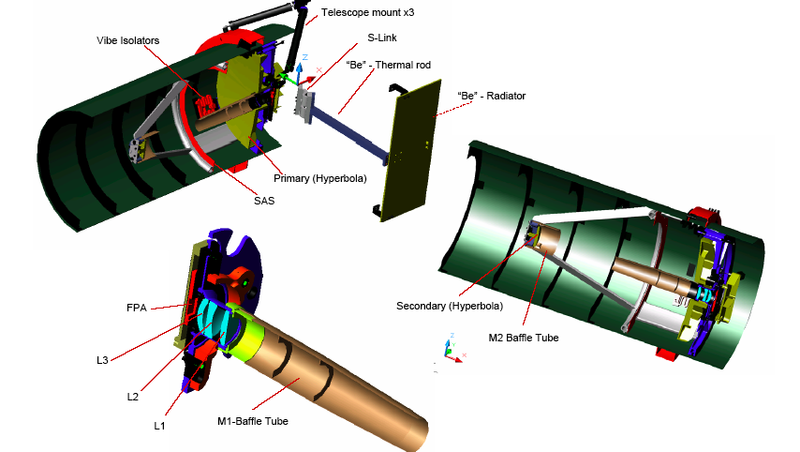 1: These are cutaway drawings of LORRI showing the telescope baffle tube, the telescope structure, the primary (M1) and secondary (M2) mirrors, the field-flattening assembly, the focal plane assembly (FPA), which consists of the CCD and its electronics, and the radiator that keeps the CCD cold to minimize electronic background noise. The primary mirror diameter is 20.8 cm (8.19 in). Fig. 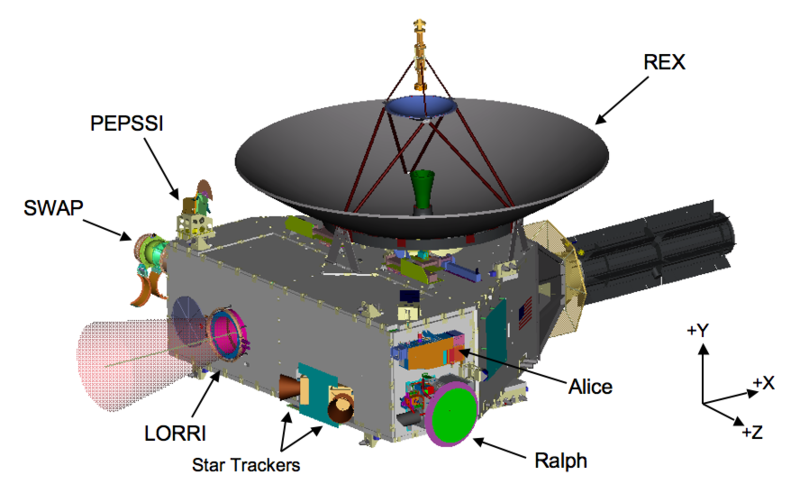 2: This drawing shows the location of LORRI and the other instruments on the New Horizons spacecraft. LORRI looks approximately along the X direction with a field of view indicated by the pink cone. The star trackers, which are used to determine the spacecraft attitude, view directions that are offset by approximately 45° relative to LORRI. The antenna diameter is 2.1 m (6.9 ft), which provides a scale for the figure. The images posted at this website have been processed by ground-based LORRI calibration software, which removes the CCD bias level, corrects for CCD readout smear (LORRI does not have an aperture shutter, which creates smear as the image is transferred from the optically active region of the CCD to the storage region of the CCD), and corrects for pixel-to-pixel sensitivity variations. LORRI images typically contain a handful of cosmic ray strikes, which are not removed by the calibration processing. These often appear as single, bright pixels, but sometimes they produce streaks of several bright pixels. They are usually fairly easily distinguished from the images of real astronomical objects (e.g., stars, planets, or satellites). LORRI images are recorded on the spacecraft as 12-bit integers with light level values from 0 to 4095. The groundbased calibration processing converts the images to 32-bit double-precision numbers. For display on this web page, the calibrated images are then converted to 8-bit JPEG files (i.e., images with 256 intensity levels) using a linear scaling stretch that maps the minimum intensity in the calibrated image to 0 and the maximum intensity to 255. Thus, the web images do not record the actual CCD signal level; nor do they retain the full dynamic range of the original images. As a result, some images that appear blank on this page actually have important data in them, but this cannot be seen in the automatically-converted 8-bit JPEGs posted here. The following ancillary information is provided for each image posted: the date of the observation in coordinated universal time (UTC) at the New Horizons spacecraft, the exposure time of the image in milliseconds, the name of the target, the range to the target in kilometers (i.e., the distance between the New Horizons spacecraft and the target; for example, 12.1M km means 12.1 million kilometers), and the root filename of the image. If you plan to use or post any of these images, see the New Horizons Image Use Policy. Q1. Why do some of the images look black? A1. An image can look black if a star or cosmic ray event is so bright that it skews the intensity scale of the JPEG image. In this case, there is a big intensity gap between the brightest object and everything else in the scene, and the important scene information is relegated to a small range of intensities near the bottom of the available brightness range. Q2. Why is the target sometimes near the edge of the field of view? A2. For most of the LORRI images, the target is placed near the center of the field of view (FOV). But for some images, the target is intentionally placed near the edge of the FOV, for example, to test a property of the instrument (e.g., the scattered light properties of the telescope), or to prevent saturation (e.g., some regions of Jupiter saturate the CCD when Jupiter completely fills the FOV, owing to the CCD readout smear issue discussed above). Q3. Some of images show diffuse arc-like features. Are those real? A3. When very faint objects are observed near very bright objects, particularly when the bright object is just outside the nominal field of view, LORRI images have "ghosts" that are produced by multiple reflections within its optics. These ghosts look like arcs, or partial arcs, with the exact appearance depending on the location and size of the bright object. Q4. Can you show some examples of LORRI image artifacts? 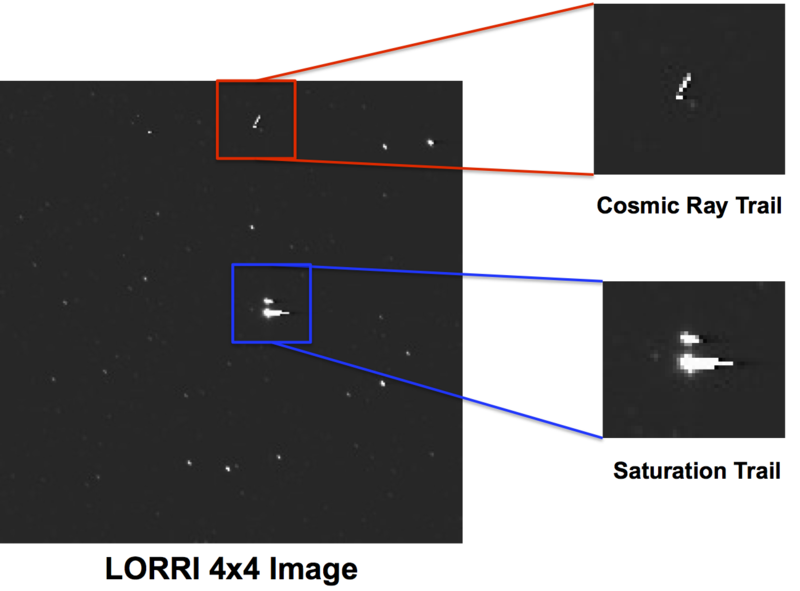 This figure shows a LORRI 4x4 image that contains a streak associated with a cosmic ray event as well as a horizontal streak associated with a highly saturated object (in this case Pluto itself with Charon just above it). "Cosmic rays" are highly energetic charged particles, produced outside the Solar System (and perhaps even outside the Milky Way Galaxy). When a cosmic ray passes through the LORRI detector (which is a Charged Coupled Device, or CCD), usually it leaves a single bright pixel at the location of impact, but occasionally the cosmic ray can leave a trail of bright pixels if it passes at a steep angle through the CCD. This figure also contains a highly overexposed image of Pluto. In this case, there is a "tail" of bright pixels extending to the right followed by a tail of dark pixels (not easily visible here). This figure is an example of a LORRI 1x1 image that is missing some data. In this case, the data are missing by design to reduce downlink data volume using a process called "windowing". The region of interest, also called the "window", is captured from the LORRI detector (the location of Pluto is marked), and the rest of the image is not even downlinked. However, the subsequent ground processing populates the missing regions with zeroes and then subtracts the bias level, which produces negative numbers in the final calibrated image. This combination of negative numbers in the "Blank Region" and "Real Data" in the windowed region, and the automatic intensity scaling used to produce the JPEG image (which ranges from the minimum to maximum values in the image), produces the banded structure seen above. A similar effect also applies to images for which data have been "lost" (e.g., data dropouts at the Deep Space Network).